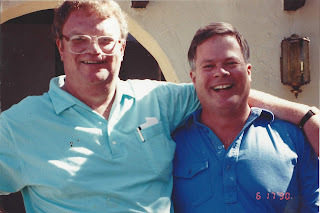 We are so grateful to J.N. 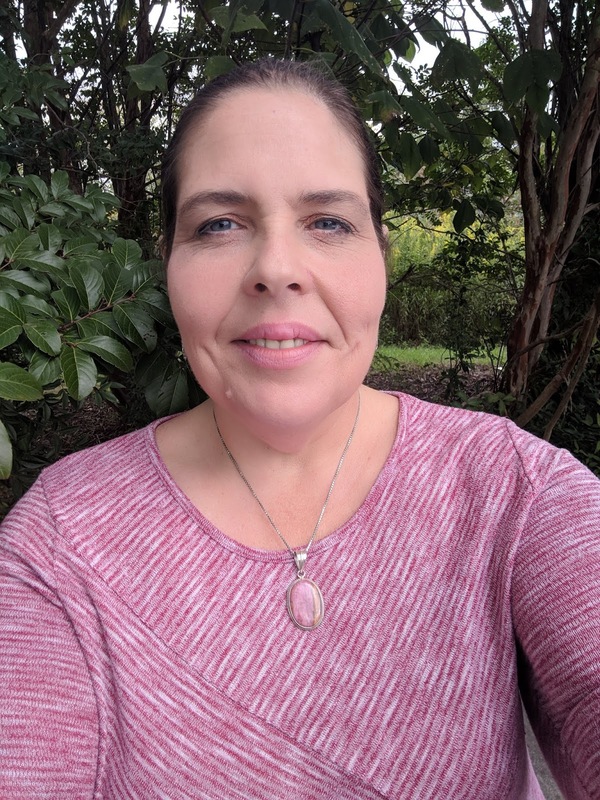 Harper, our Canadian distributor, who is once again the presenting sponsor of the Hopes & Dreams Quilt Challenge for ALS, contributing $2500 toward research to help find a cure! JN Harper is a fourth-generation Canadian business which began in 1924. Harper’s converts and distributes fabrics ranging from fine apparel, exquisite Italian shirting’s, a full range of interfacings, as well as a full complement of products for the quilting industry – batiks, cotton prints, excellent basics and batting. For more information on the fabrics we carry and distribute please visit www.jnharper.com or follow us on social media @JNHarper1924. JN Harper continues to support ALS and the Hopes & Dreams quilt challenge because of our dear friend Kathy Thompson. Kathy has known the Harper family for many years and has not only been a great business partner but a wonderful friend. When hearing of her son’s story and battle with ALS we knew we had to step in and help build awareness for ALS across the country. 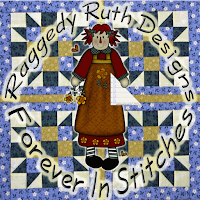 When I started working for Quilters Dream Batting I knew that I had to sew a quilt. Being around our Batting and learning about quilters and their art, it was only a matter of time that I would be elbows deep in a new project. Sewing is something I've always loved; costumes, alterations, and applique work are all in my wheelhouse. 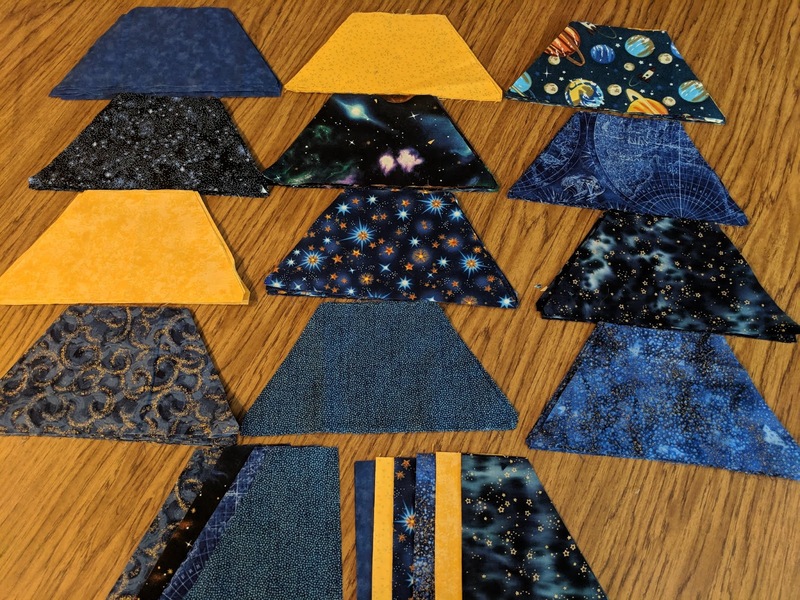 Having fairly decent sewing experience, I decide to go big! 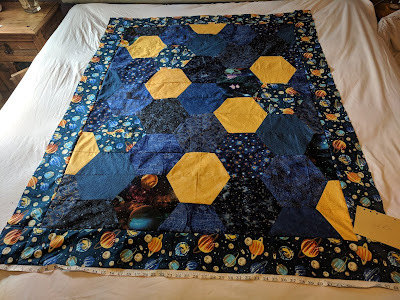 I made a Half Hexie Minky Space Quilt!! Like most crafters, I scoured the internet to find the perfect tutorial. 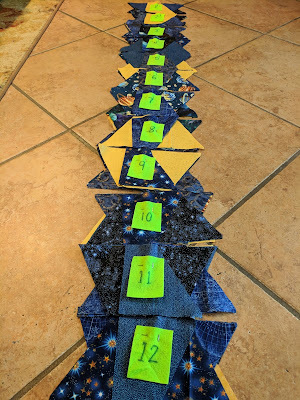 Pinterest led me to a blog from Polkadot Chair, the perfect guide to help walk me through my very first quilt. The first step (and my favorite step) was to pick out my fabric and plan the top of my quilt. Luckily I had all the fabric I needed to create the quilt top. My son was the person receiving the quilt, so he choose a navy blue minky fabric for the backing. 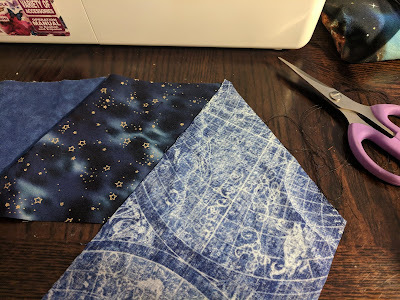 My closest fabric store didn't have the half hexie stencil I needed. So my wonderful husband ran out to Home Depot and bought a small acrylic sheet and made me a half hexie stencil. He used a router and cut out a half hexagon shape (he modeled the shape from the Lori Holt Half Hexie ruler in 10” above). Motivated to start this quilt, I cut the fabric into 5 inch strips. To cut the hexies I first folded the fabric in half and held the stencil steady as I cut diagonally along the stencil. 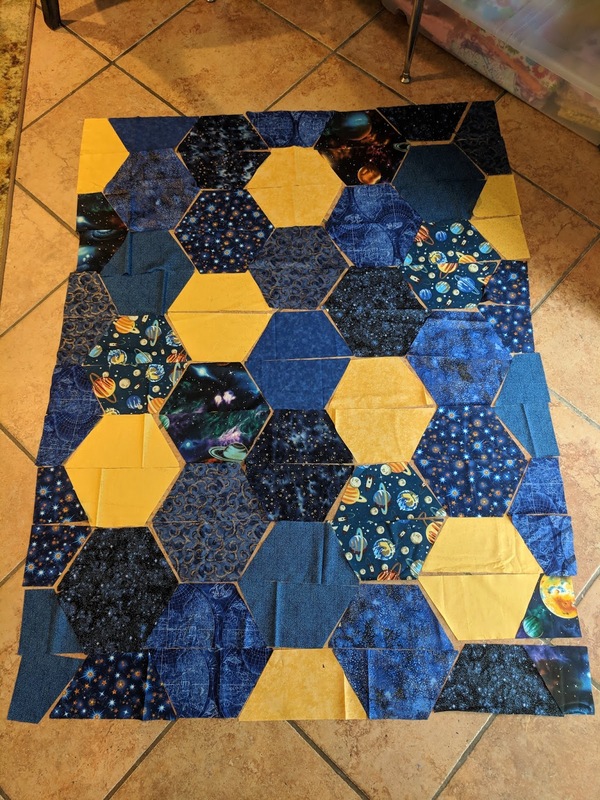 It will create more hexies when you cut them side by side and use the end pieces for the sides of the quilt. I managed to keep the cat away long enough to stack the pieces from left to right by rows. 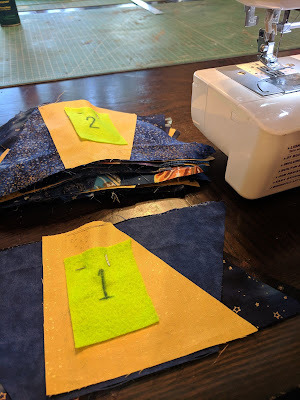 I used a scrap square of felt to make tags numbered 1-12 and pinned them to the corresponding rows. 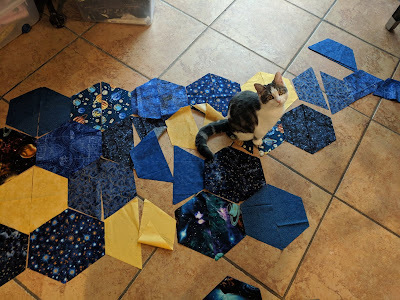 It made sewing each row "sew" much easier and I didn't have to leave the hexies laying around on the floor for the cat to play with them. 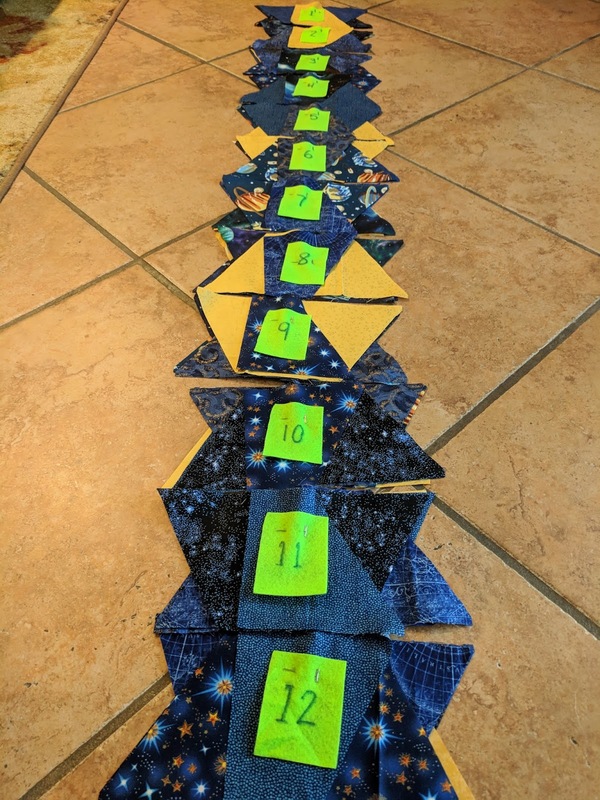 Starting with my first row, I sewed each hexie together on the diagonal side. 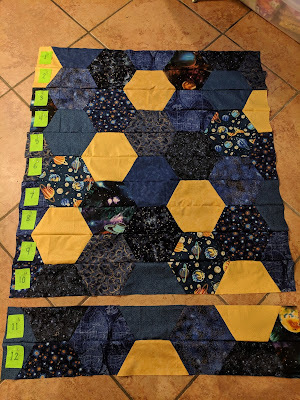 That created one long row of hexies that alternated up and down. I did that for each row, making sure to attach the tag back on so I didn't confuse the order. 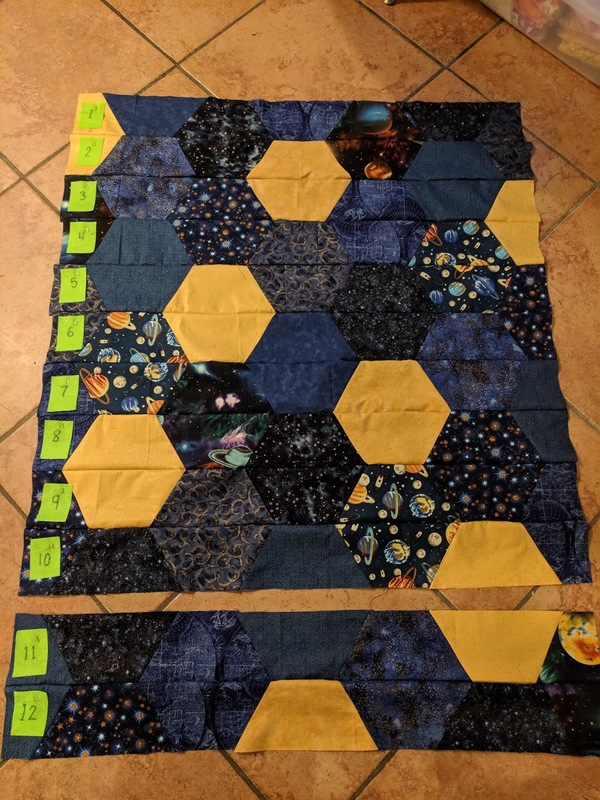 After all the rows of hexies were sewn, I sewed the rows together. It's finally starting to look like a quilt! Originally I was going to leave it borderless, but it looked a little small to me. 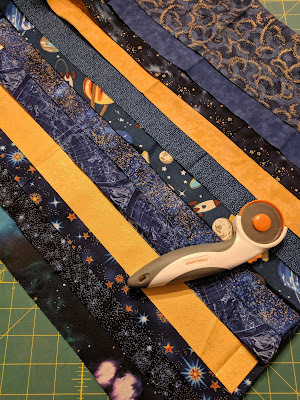 I used fleece with a space theme as the boarder and cut it into 5 inch strips. 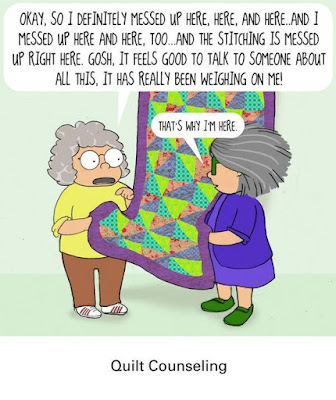 Total size of the quilt top was 62x50. I’m Teresa Silva and Quilting is My Bliss. Really it is my bliss but also my business. 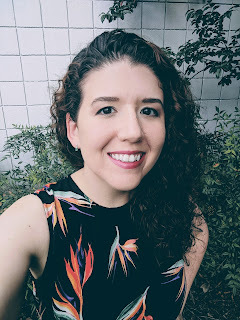 I’ve been a longarm quilter for almost 7 years now and I totally love what I do; so much I decided to write a book and share some of my thoughts with you. 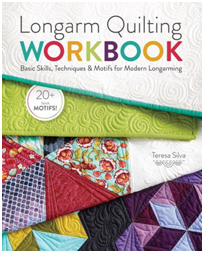 My new book is called Longarm Quilting Workbook, printed by F+W Media. It’s geared for the beginner longarm, midarm, or domestic quilter all the way up to advanced quilters. 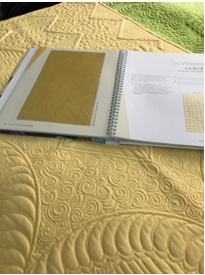 It’s a hardcover, spiral bound book so it makes it so easy to open it up and practice designs on paper or actually quilting them out. It includes information to help you make a decision in buying a longarm, learning new motifs, to creating beautiful whole cloth quilts. Plus a bonus chapter of “Eye Candy” quilts. 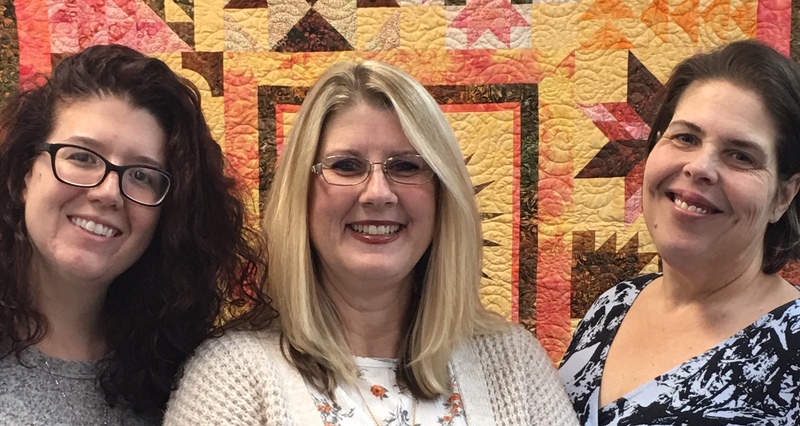 If you have been following along with me at all, you probably know I’m a huge Quilters Dream fan so it’s my honor to be allowed to post on their blog today. It’s my number one go to batting choice. My favorites are Quilters Dream Poly Select, Dream Blend 70/30 and Dream Wool. 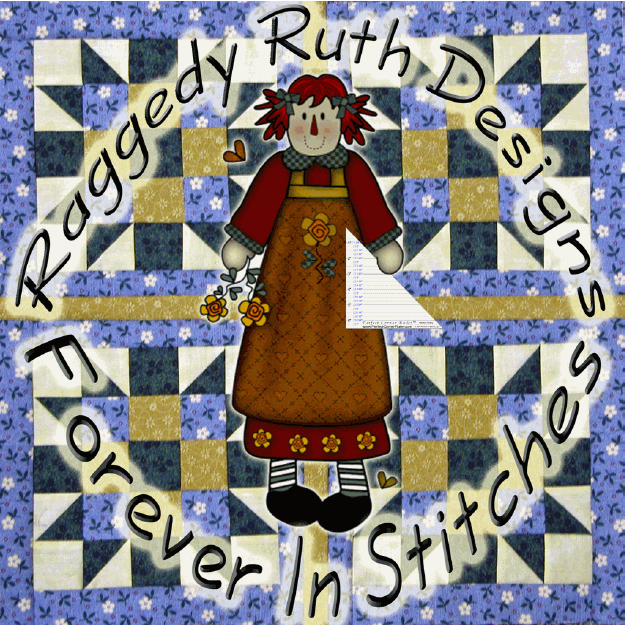 I used their batting in all my quilts in this book. 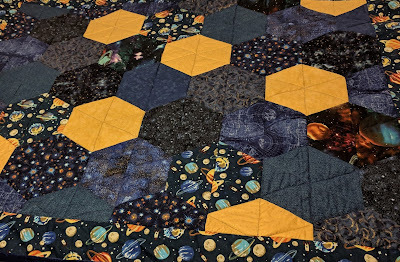 Here are a couple whole cloth quilts I did for my book. I used a layer of Dream Blend 70/30 and Dream Wool for these. 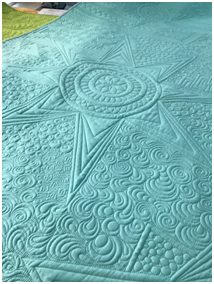 This first quilt – Medallion Stars – Lap Quilt has such beautiful texture. It is actually my most favorite quilt out of the book. I’m so glad to finally have it home with me. This second quilt is Scalloped Center table runner. It’s a small project and works great to practice some of your newly learned motifs. There is a grid running behind the design to give the illusion of a zig zag running through it. 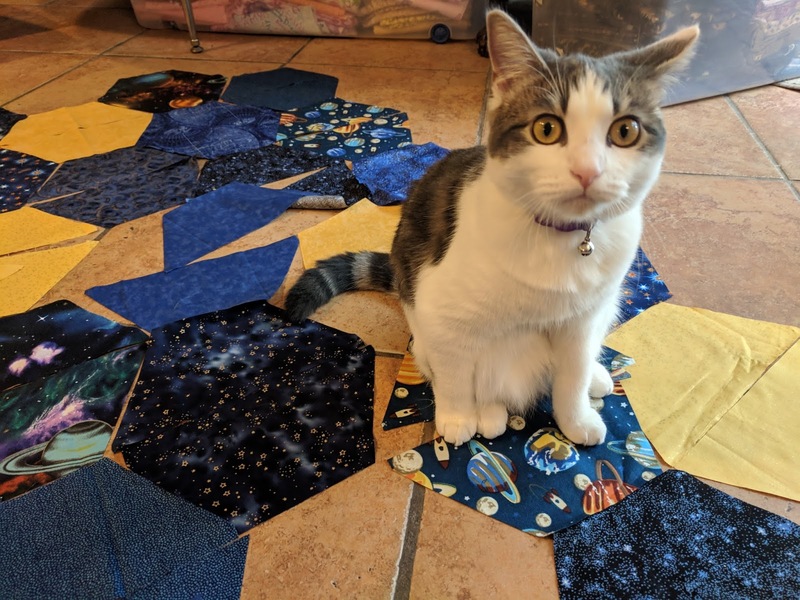 As you can see it makes the quilting really pop! I have lots of inspiration for you in Chapter 3 – Doodling & Drawing. 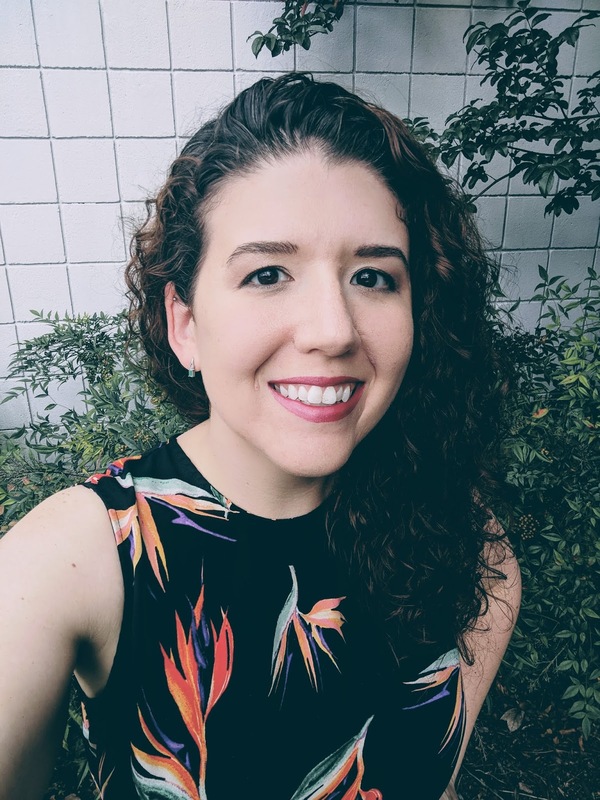 Please take the time to check it out and most of all I hope you find something that makes your heart happy and inspires you to create something awesome for yourself! 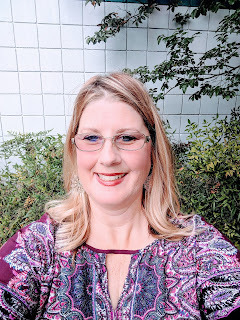 Please continue to follow along our blog hop and make sure and come back to my blog quiltingismybliss.com on October 17, 2017 and leave me a comment before Friday, 10/20/17 at 4:00 p.m. pacific time when I will choose two winners! I have some fantastic prizes I will be giving away thanks to some very generous donations. Make sure to check out Kristen McVane (Stashquilts on Instagram) on Monday, October 9 when she will be posting about my new book. She doesn’t have a blog but she posts a lot of fun stuff and she has new patterns available and one is featured in my book called “Friendship”. Check it out! Thanks so much for visiting! Have a fantastic day. Congratulations to the Winners of our Hopes & Dreams Quilt Challenge for ALS! Thanks to all the generous sponsors, we were able to award even more prizes this year than we anticipated! I honestly feel that this year's prizes are better than ever. Congratulations, to all the winners, and a big THANK YOU to everyone who donated to our 2016-2017 Hopes and Dreams Quilt Challenge for ALS! Voting will begin soon to choose the winners for our Sew Popular Category!